A 15-year-old embarks on an affair with her mother's boyfriend. "It's a rare movie that will appeal as much to teenage girls as adults. A teenage audience may well nod along to Minnie's words and actions, but the rest of us will frown, chuckle, and worry. In our own ways, we'll both be correct." Amid all the massive budget superhero movies of recent years, the best comic book adaptation was a small Swedish movie about teenage girls and their everyday live, We Are the Best!. 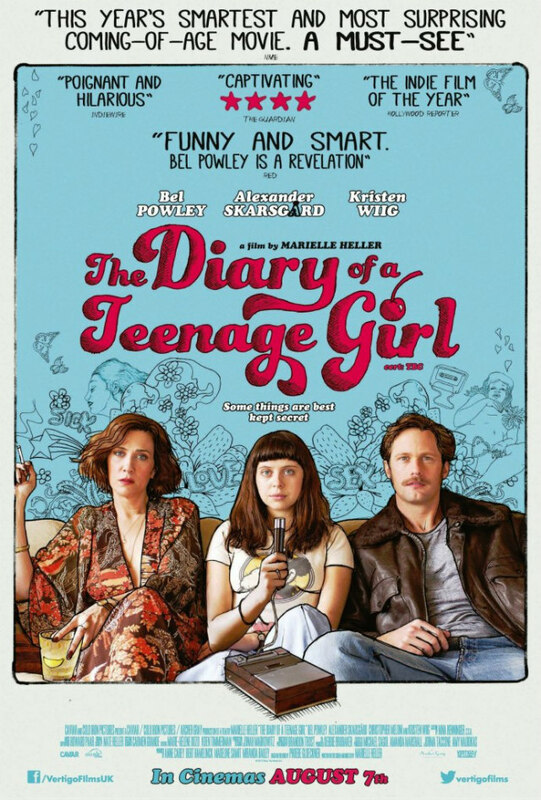 Now we have another worthwhile comic book movie, adapted from Phoebe Gloeckner's graphic novel The Diary of a Teenage Girl: An Account in Words and Pictures. It's a rare movie that will appeal as much to teenage girls as adults, though each group will view the film through very different eyes. 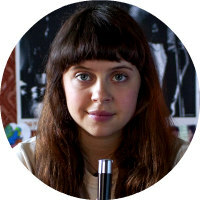 The teenage girl in question is Minnie (a star-making turn from Bel Powley, thoroughly convincing despite being almost a decade older than her character), a 15-year-old in 1976 San Francisco, a place and time transitioning from the hippy, hash-smoking era to the coke-snorting disco period. Minnie's mother Charlotte (an under-used Wiig) embraces this lifestyle, likely the reason for her separation from Minnie's stepfather Pascal (Christopher Meloni, whose cameo provides one of the movie's most amusing moments). Charlotte's current boyfriend is hunky slacker Monroe (Alexander Skarsgard, playing a dumb version of his nice-guy toyboy from What Maisie Knew), who draws the attention of Minnie's raging hormones, despite being two decades her senior. One evening Charlotte declines Monroe's invitation to accompany him for drinks, suggesting Minnie tag along. That night, Minnie drunkenly confesses to her attraction for Monroe, and thus begins an illicit and illegal affair. If you've seen Andrea Arnold's Fish Tank, you'll be familiar with most of the plot points here, but tonally it couldn't be more different. In her confident debut, writer-director Marielle Heller never judges her characters' taboo actions, throwing us, somewhat uncomfortably, in the middle of this relationship. Minnie and Monroe have opposing arcs; the former initiates the relationship as she believes she has fallen in love with the older man, but soon realises her attraction is purely sexual, while Monroe initially sees the younger girl as no more than a sexual fling, only to develop genuine feelings for her. Teenage girls will cheer on Minnie's quest while adults will cringe at her naivete. The movie will be just as good for both audiences. I have to admit, as soon as Minnie's voiceover narration began I sank into my seat. There's nothing worse than an 'insightful' teenage narrator, but that's not what we get here. We never feel Minnie is lecturing us; quite the opposite. Like most teenagers, due to lack of life experience, she's not very bright, and she's woefully naive. Again, a teenage audience may well nod along to Minnie's words and actions, but the rest of us will frown, chuckle, and worry. In our own ways, we'll both be correct.